"CM of Andhra promised to develop the infrastructure of Andhra but took a U-turn". The two projects the Prime Minister would dedicate to the nation include ONGC's Vasishta Gas Field in the Krishna-Godavari basin, set up at a cost of Rs 5,700 crore, and a storage facility of ISPRL, an undertaking of Petroleum Ministry, built at a cost of Rs 1,125 crore, the MP said. He also addressed a public function in Itanagar, where he stressed that improving connectivity to the north-eastern state was important. 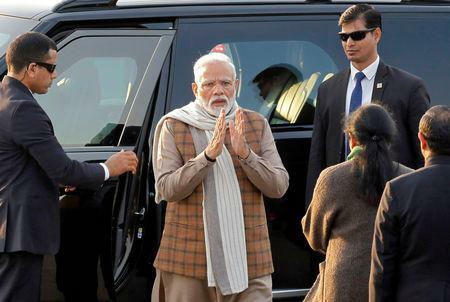 After Guntur, Modi will leave for Tiruppur in Tamil Nadu and will lay the foundation of various projects. He said, the corridor in the state will bring industry and investment opportunities for the youth. At Hubli in Karnataka, the Prime Minister laid the foundation stone of Indian Institute of Technology - Dharwad and Indian Institute of Information Technology - Dharwad.